we produce barolo in the heart of cannubi, in family. For five generations we cultivate with love our vineyards to produce traditional wine, able to transmit all the authenticity of our land. From 1897, our cellar is on the top of Cannubi. Owning three hectares on three main sides in the heart of Cannubi is a priceless and unique source. Each year we pick the individual vineyards by hand, and we keeping the grapes separate, if possible, until the end of the alcoholic fermentation. Before storing the wines in the large oak barrels for aging, depending on the weather conditions of that year, and the quality of the grapes, we decide whether to keep the three vineyards separate or put them together, or partially mix them. 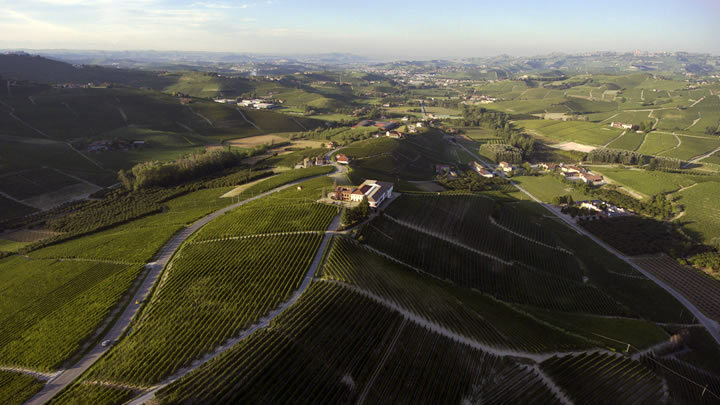 Sometimes, we choose a singular vineyard to use for our Barolo Cannubi Riserva, in the best vintages. So, each year, wine surprises us with different and unique tones. We believe it is our duty to keep telling the tradition that made our land’s wines so special. Works in the vineyard do not really follow specific rules: every year they get adapted to the vine’s different needs, due to the weather conditions of that year. In the cellar, our work is limited to preserving what the vineyard and the vintage give to us. We make our wines ferment in big wooden vats, and we use big Slavonian oak barrels, having a capacity of 25-50hl, as the tradition shows.